I made you some healthy lemon tarts. I love all things lemon. Who doesn’t? Lemons just seems to freshen every dish up. Sweet or savory. It doesn’t matter. So I created a healthier lemon tart for you. 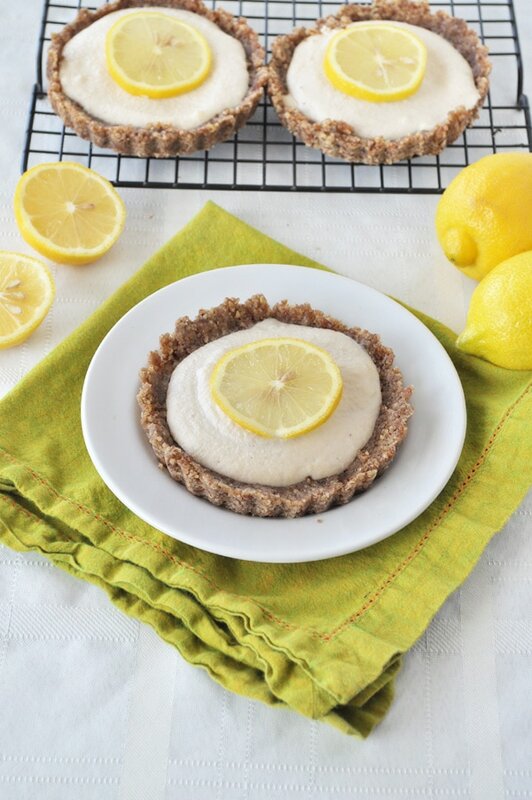 These healthy vegan lemon tarts are perfect for Easter. If you like this recipe, you may also like my grain free blueberry tart. 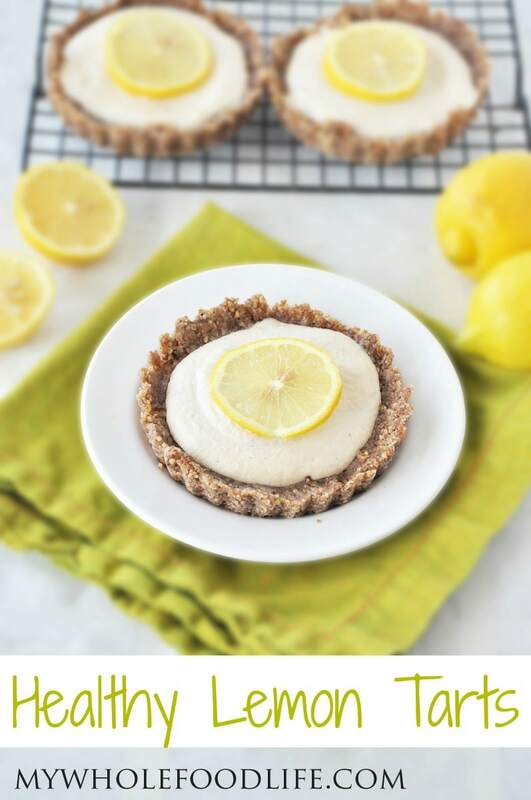 This lemon tart recipe is not only healthier, but it’s easy too! This is also a recipe that fits almost every diet. It’s grain free, gluten free and vegan. These lemon tarts may look fancy, but they really only take a few minutes to make! I hope you enjoy them as much as I did. Looking for more healthy lemon recipes? An easy recipe that comes together in minutes! In a food processor , combine the ingredients for the crust. You will get a wet, loose dough. Press the dough into greased tart shells. I used 4 inch tart shells and got 4 tarts. You can probably do o 1 large tart as well. Stick the tart shells in the fridge to firm up while you make the filling. Combine all the filling ingredients in a food processor or blender and blend until smooth. Pour the filling into the tart shells and stick them back in the fridge to firm up. I would give them a good 4 hours to set. If you can wait overnight, that is even better. Store the tarts in the fridge. They should last at least 7-10 days. Enjoy! Ok so I finally got to make this (got a few spring form pans) and it is DELICIOUS! I did take a cue from one of your other recipes though & lined the crust with fresh blueberries before adding the filling...YUM! So glad you liked these! This is one of my favorites. It is a new favorite of mine...just made it again!! Went & picked fresh blueberries & just had to. Oh, & I wanted to mention that I made one's more tweak...courtesy of veggies don't bite...I added a bit of nutritional yeast flakes to the crust because it adds a sort buttery taste that complements the pecans so well. I try to get n.y.f. in when I can & this gives me one more avenue for their inclusion. :) Hope you are having a great week! Oh great idea!!! I am totally going to try that next time! Is there a reason for using cashews vs cashew butter? Would cashew butter work? Thanks.